Global value chains offer a new way for developing countries to industrialise. This column provides a deep examination of the pattern of developing countries’ integration in these chains and shows that changes in integration are increasingly driven by low- and middle-income countries, while the integration of high-income countries has begun to even out. It also shows that low- and middle-income countries are still more specialised in downstream activities and typically export less domestic value added. For developing economies, the emergence of global value chains (GVCs) offers a new path to industrialisation, one with potentially lower thresholds than prior paths since technological and scale constraints are removed by a facilitated access to inputs from advanced nations. However, most analyses of GVC integration patterns use high-income and upper-middle-income samples or basic GVC indicators such as the foreign value added content of exports (i2e) or the domestic value added content of foreign exports (e2r) (e.g. Johnson and Noguera 2012, Kowalski et al. 2015). Based on such indicators, research typically finds that differences in GVC integration patterns between developing and advanced countries are relatively minor. In two seminal papers, Wang et al. (2013, henceforth WWZ) and Koopman et al. (2014) provide the theoretical tools to derive a new set of more detailed GVC indicators, that allow us to zoom in on GVC integration patterns more closely, thereby revealing information that is not available from the standard GVC indicators used so far. In two recent papers, we implement this theoretical work into automated procedures for the software R and calculate the newly available indicators and a set of further measures for the most recent version of the OECD Inter-Country Input-Output tables (ICIOs) which cover 61 countries over the period 1995-2011, including many developing economies (Quast and Kummritz 2015, Kummritz and Quast 2016).1 This allows us to deepen our understanding of developing economies’ GVC integration patterns considerably. Table 1 shows for the new, more extensive, data the well-known stylised fact that the average integration measured by either i2e or e2r does not vary strongly between income groups. High-income economies have slightly stronger forward linkages but lower backward linkages, which implies that their exports contain more domestic value added but the difference in relative terms is small. It is interesting to note that the change from 1995 to 2011 is much more pronounced for developing economies. In line with this, Figure 1 illustrates how the share of developing countries in global GVC trade has increased, reaching for backward linkages 33% in 2011.
returned domestic value added (rdv). The fva variables are expressed as shares of total foreign value added in exports, while the dva and rdv variables are expressed as shares of total domestic value added in exports. The reason behind this selection is as follows. When low-wage developing countries enter GVCs, they tend to specialise in assembly and then try to move up within the value chain. To illustrate this, we take the example of the iPhone. Most of its value added is from advanced economies but assembly takes place in China. This means that when China enters this GVC, its fva_fin is high since it imports foreign value added, assembles it, and exports a final good. However, when its technology improves, due to the interaction with advanced economies, it might be able to produce parts of the phone which contain more value added. Eventually, it might even be able to outsource assembly to a cheaper country. This would imply that it seizes a larger share of the value added, something commonly referred to as upgrading or moving up the value chain. In this case the WWZ decomposition would show that China’s fva_fin starts to decline with a simultaneous increase in fva_int. In line with this, we observe in Table 2 that the GVC trade of high-income economies is indeed more intensive in intermediate goods than the GVC trade of developing economies. 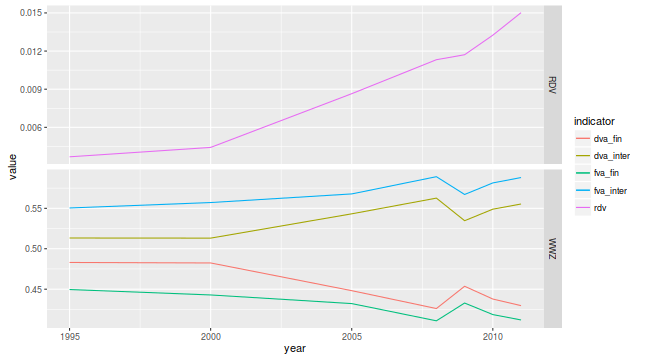 The average fva_inter, dva_inter, and rdv values are higher than the corresponding values of developing economies while the opposite is true for dva_fina and fva_fin. In relative terms, there is a particularly strong difference in the rdv term, the domestic value added that is first exported and then returns home. This term suggests that high-income countries provide upstream intermediate inputs but also serve as final demand markets.3 Interestingly however, Figure 2 shows that the structure of developing economies’ GVC trade increasingly approaches the high-income structure. The rdv value has more than tripled between 1995 and 2011, albeit from a low initial value. Similarly, dva_inter and fva_inter have increased at the expense of fva_fin and dva_fin. Next, we zoom in from income group aggregates to country-level data, to show that there is significant heterogeneity among developing economies with regard to this development.4 Table 3 shows that the positive overall trend of the developing economies is driven to a large extent by the South-East Asian (SEA) countries in the sample. While Cambodia and, to a lesser extent, Vietnam on average perform mostly assembly tasks with typically low value added, Malaysia, Thailand, and the Philippines exhibit much lower fva_fin and dva_fin but higher rdv values. Comparing these results to the analysis by WWZ, we find that the latter set of countries has a similar GVC integration structure to Indonesia but still lags behind the more advanced nations such as South Korea. When we look at the change over time from 1995 to 2011, we see that Cambodia has actually moved into assembly with an increase of fva_fin of 35.2%. This stands in stark contrast with the remaining Southeast Asian countries, which all managed to move up the value chain. In particular, Vietnam, which exhibits the highest decline of fva_fin, might soon catch up to its local competitors regarding its position in GVCs. For Cambodia, on the other hand, this means that GVCs offer a major untapped potential for future growth. Moving on to Latin America, we know from standard indicators that GVC integration levels tend to be relatively low.5 Exceptions are Costa Rica and Chile, which highlights the role of remoteness and sound policies as drivers of GVC integration. Thus, focusing on these two countries, we observe in Table 4 that Chile’s GVC integration structure resembles the structure of high-income countries. The largest part of the country’s integration is through intermediates as shown by the high fva_inter and dva_inter shares (78% and 75% respectively). However, the share of returned domestic value (rdv) is much lower than the high-income average of 2.4% and thus indicates that Chile is still in the process of catching up. Costa Rica possesses the typical GVC integration structure of lower middle-income economies, with high fva_fin and dva_fin shares and a very small rdv value of 0.02%. Comparing the country to Southeast Asia, its structure resembles most closely the GVC integration of Vietnam. This comparison holds also when we look at Costa Rica’s development over time, where we see a rapid expansion of fva_inter, dva_inter, and rdv shares. The country is thus successfully moving up the value chain. To conclude, we discuss the two African countries in the sample, South Africa and Tunisia. They offer two interesting and unique cases since they have relatively stable political environments and a relatively high degree of industrialisation, thereby fulfilling the basic requirements for GVC integration. Tunisia has in fact relatively high integration levels and its integration is similar in both structure and trend to Costa Rica and Vietnam, meaning high backward linkages and a move up the value chain. This is evidence that North Africa with its proximity to the European GVC hub can link into and benefit from GVCs. South Africa is a different case since it is located far from most production networks and focuses primarily on raw materials. As a result, the country’s integration levels are fairly low and more similar to Argentina and Colombia. Nevertheless, it is likely that it has benefitted from the boom in commodities caused by the rise of GVCs and the subsequent boost in global demand. To summarise, we find that anecdotal evidence on the differences between developing and developed economies’ GVC integration can be confirmed by the data once more detailed indicators are used. Setting aside primary sectors, high-income economies are typically positioned more upstream in the value chain, which can be seen from the concentration of their value added in intermediate goods exports. In addition, they also serve as markets of final demand, shown by their relatively high share of exported domestic value added returning home. Developing economies, on the other hand, tend to be positioned more downstream, as indicated by their high share of final goods exports and their relatively low values for forward linkages and returning domestic value added. These two stylised facts suggest that high-income economies use GVCs to outsource low value added downstream production stages and eventually re-import the final goods. However, when looking at the development over time, it appears that many developing economies have succeeded in moving up the value chain and that the general trend points to a more even distribution of value added across the different countries. Overall, we show that low- and middle-income countries have become an integral part of GVCs and are increasingly becoming the driver of their expansion. Authors’ note: The views expressed therein are those of the authors only and do not necessarily represent the views of the World Trade Organization or the United Nations Conference on Trade and Development. Johnson, R, and G Noguera (2012), “Accounting for intermediates: Production sharing and trade in value added”, Journal of International Economics 86(2): 224-236. Koopman, R, Z Wang, and S-J Wei (2014), “Tracing value-added and double counting in gross exports”, The American Economic Review 104(2): 459-494. Kowalski, P, J Lopez Gonzalez, A Ragoussis, and C Ugarte (2015), “Participation of Developing Countries in Global Value Chains: Implications for Trade and Trade-Related Policies”, OECD Trade Policy Papers No. 179. Kummritz, V, and B Quast (2016), “Global Value Chains in LICs,” CTEI Working Papers 2016-10, Centre for Trade and Economic Integration, Geneva. OECD-WTO (2012), "Trade in value-added: concepts, methodologies and challenges", Joint OECD-WTO note. Quast, B, and V Kummritz (2015), “decompr: Global Value Chain decomposition in R”, CTEI Working Papers 2015-01, Centre for Trade and Economic Integration, Geneva. Wang, Z, S-J Wei, and K Zhu (2013), “Quantifying international production sharing at the bilateral and sector levels”, National Bureau of Economic Research, 21 November. 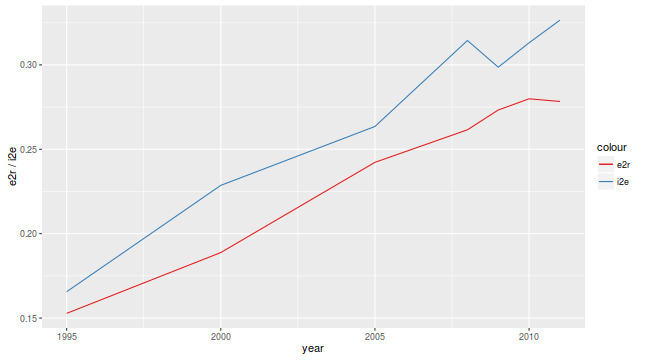 An interactive demonstration of the R package is available here. It allows for the calculation of the detailed indicators without any advanced knowledge of statistical software. We define developing economies as low-income and lower-middle-income economies as classified by the World Bank in 1995. Note that while the average value seems small, rdv can account in certain country-sector pairs for more than 25% of their exported domestic value added (e.g. US steel). We focus in particular on the new set of developing economies in the OECD database to avoid overlap with WWZ’s discussion of China, Chinese Taipei, Indonesia, India, and South Korea. Note that we focus here only on Argentina, Chile, Colombia, and Costa Rica since data on Brazil and Mexico has already been available in previous databases.